Find dining room sets at Decor8. Our beautiful dining sets will be the perfect fit for your dining room. As the primary furniture pieces in your dining room setting, dining tables and chairs set the mood and design for your interior. Our special, affordable dining room sets features a wide range of dining sets to suit a range of interior design needs from casual 5 piece dining sets to more extravagant sets including side boards or buffets. Our dining sets are tried and tested combinations that are popular picks amongst our residential and commercial clientele. 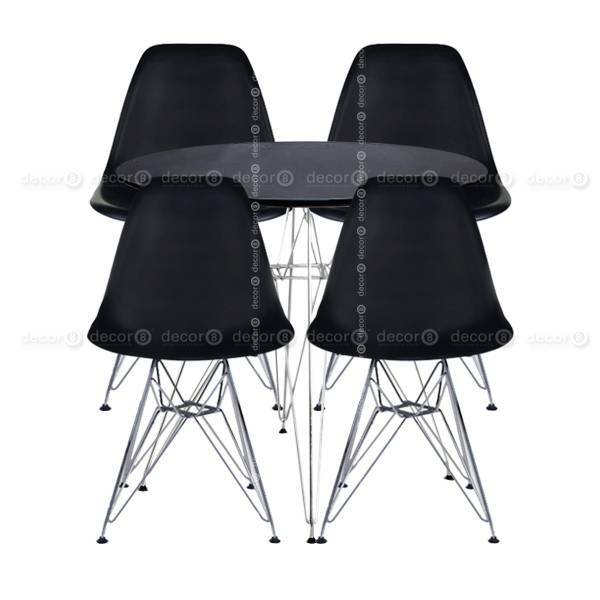 The dining room set presented here features one Eiffel Round Black Dining Table and four Eiffel Dsr Black Dining Chairs. All dining sets require a fabrication lead time of approximately 2-3 weeks. For rush orders please contact us at info@decor8.com.hk.